One such boat from the German towns of Bingen and Rüdesheimer to Bacharach lasts shortly, but allows visitors to touch the old Germany, in the southwestern German state of Rhineland-Palatinate. The ship passes through Lorchhausen, Lorch and the fortress Nollig, on the left bank of the Rhine, which is now buried in ruins. Most visitors take a climb called "Devil's Ladder", which takes them to the ruined castle. Almost immediately after Noling, on the opposite bank of the river sees another half-destroyed castle, dominated by the rugged bastion - Castle Furstenberg , who is in the hills right on the beach. 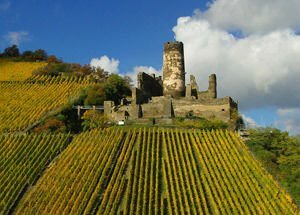 Further, Furstenberg is followed by the castle Heimburg, built after 1290 by the Archbishop of Mainz and a former Roman fort. Followed by Niederheimbach, surrounded by three castles in ruins - north of the fortress Furstenberg and south of Castle Sooneck. Furstenberg Castle stands proudly on its hill, and at the foot of the town Rheindiebach. As the year of the rise of the medieval fortress is taken to be 1219. Furstenberg is built on the orders of the Archbishop of Cologne, who wanted to protect their property. Twice - in 1620 and in 1632, the castle Furstenberg is consistently fascinating to the Spaniards and Swedes.